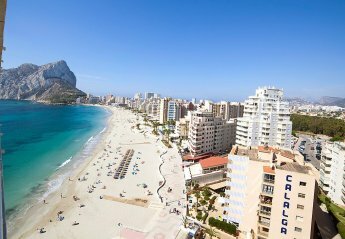 Although within close proximity to Benidorm, Calpe is a much less busy resort with a more relaxed atmosphere. 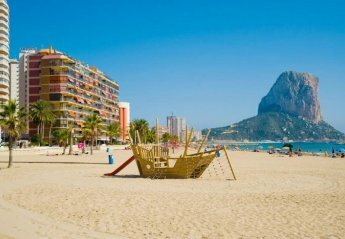 Close enough to visit Benidorm but situated away from the lively environment, holidays in Calpe are ideal for those who prefer a quieter, more relaxed surroundings. The Rock of Ifach is one of Calpe’s well known landmarks which towers to an impressive 332m high right off the sea front. Considered a genuinely tough climb and not for the faint-hearted, the peak showcases magnificent views and on a clear day even the island of Ibiza can be seen. If you prefer to take in the sites from the ground then let’s not forget the superb blue flag beaches Calpe has which stretch 5km along the Costa Blanca coastline. Found 419 holiday rentals in Calpe. A beautiful villa with 12 mtr kidney pool set in large peaceful, totally private garden with lawns & palms. 5 mins walk to the beach, restaurants & shops. Relax and unwind in our paradise in the sun. This villa has an enviable location, the pool and terrace are south facing offering sun until late evening. Detached individual villa 3 double bedrooms, 2 shower rooms (1 en-suite). Private pool/gardens, fully equipped kitchen, UK TV/DVD. Quiet residential area, views, nr beaches, ideal for families. Wi Fi. 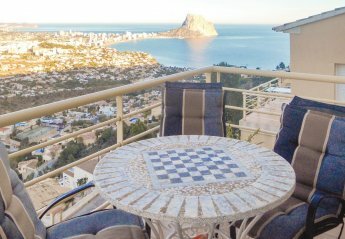 This cosy home features wonderful panoramic views of the sea and the Penon de Ifach, which is one of the most striking landmarks in the Costa Blanca region. This beautiful house is divided into two living areas connected by an external staircase. 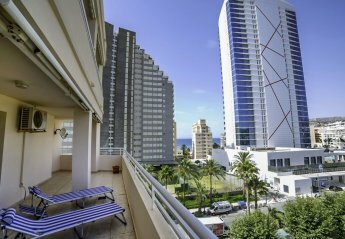 You have a beautiful panoramic view of the sea, Calpe and Penon de Ifach from both the floors. 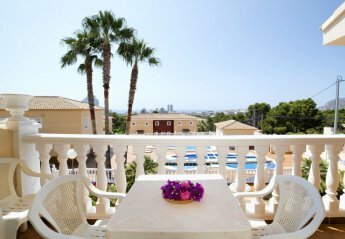 This bright and airy holiday home is wonderfully located close to a pebbled beach and approximately 5 km from the centre of Calpe. Situated in the sunny location of Mary Villa with stunning views of the sea and the Penon de Ifach, this holiday home has a freshly painted facade. It is situtated directly at the large private pool. This lovely holiday home in a unique residential location, with stunning views of the mountain, is only 500 metres from the beach and the harbour. Spacious and bright holiday home with three bedrooms and a spacious living room in a village near Calpe, which is only 10 minutes away from fantastic beaches. This modern and new holiday house offers a comfortable stay for family or friends. The house is located in a quiet, residential area of Calpe. 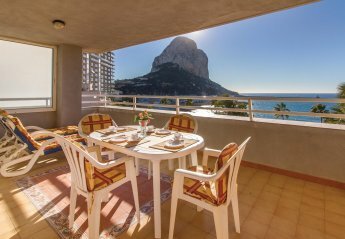 This holiday apartment is next to the beach in a central residential area with fantastic views of the Penon de Ifach of Calpe. Restaurants and shops are not too far away. This sunny and centrally located holiday home in Calpe is just at a distance of 5 minutes by walk to all amenities and 10 minutes away from the stunning beaches. 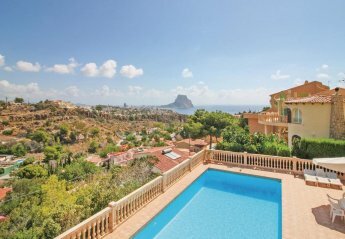 This Gorgeous villa in a perfect location in Calpe Spain. The villa is part of a small gated community and has 3 bedrooms that sleep 6 comfortably with air con for those warm nights. Located in a private garden plot in the residential beach area of Calpe lies this attractive looking Villa Emma. Big enough to sleep 6 people and located all on one level. This beautiful villa located a short drive from the town of Calpe, Costa Blanca encompasses a real sense of luxury and home comforts to offer guests an excellent holiday to Spain. This large, bright holiday home with private swimming pool is located in a village 1.2 km from the beach in Calpe, ideal for large families or holidays with friends. There is a spacious. Casa Empedrola is a very well-furnished and presented villa with lovely open views. A short drive from the town of Calpe with a vast array of restaurants, bars, shops. This cosy four bedroom holiday home is well located, close to the viewpoint of Mount Toix. It is well-equipped with four comfortable bedrooms, a kitchen, living area, two bathrooms and a WC. 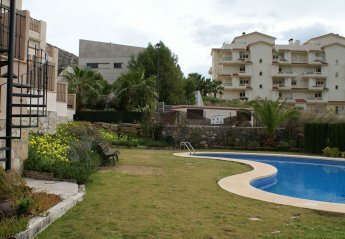 This 2 bedroom apartment with swimming pool is located in Calp and sleeps 4 people. It has air conditioning, barbeque facilities and parking nearby. The apartment is near golf and beach. 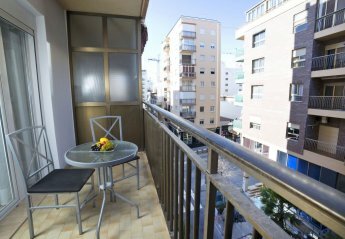 This 1 bedroom apartment is located in Calp and sleeps 4 people. The apartment is walking distance away from golf and beach. This 2 bedroom apartment with swimming pool is located in San Gabriel and sleeps 4 people. It has WiFi, air conditioning and parking nearby. The apartment is near golf. 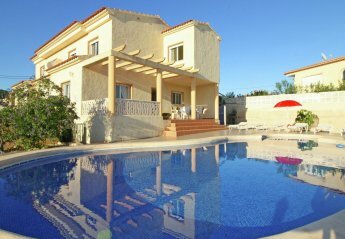 This 5 bedroom house with private pool is located in Calp and sleeps 10 people. It has WiFi, air conditioning and a garden. The house is near golf and beach. 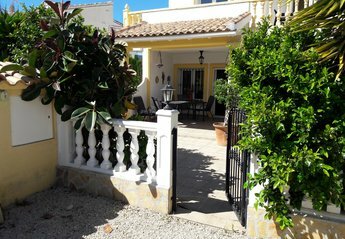 This 8 bedroom house is located in Calp and sleeps 16 people. It has WiFi, air conditioning and barbeque facilities. The house is walking distance away from golf and beach. 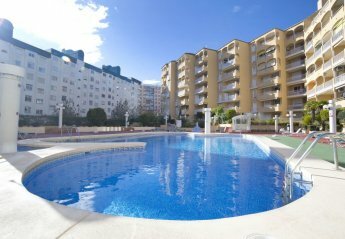 This 1 bedroom apartment with swimming pool is located in Calp and sleeps 2 people. It has WiFi, air conditioning and a garden. The apartment is near golf. This 3 bedroom apartment with swimming pool is located in San Gabriel and sleeps 6 people. It has WiFi, air conditioning and a garden. The apartment is walking distance away from golf and beach. This 2 bedroom apartment with swimming pool is located in San Gabriel and sleeps 4 people. It has WiFi, air conditioning and a garden. The apartment is walking distance away from golf and beach. This 1 bedroom apartment with swimming pool is located in San Gabriel and sleeps 4 people. It has WiFi, air conditioning and parking nearby. The apartment is walking distance away from golf and beach. This 2 bedroom apartment with swimming pool is located in San Gabriel and sleeps 4 people. It has air conditioning, garage and parking nearby. The apartment is walking distance away from golf and beach. This 6 bedroom house with private pool is located in Calp and sleeps 12 people. It has WiFi, air conditioning and barbeque facilities. The house is near golf and beach. This 2 bedroom house with private pool is located in Calp and sleeps 4 people. It has WiFi, barbeque facilities and parking nearby. The house is near golf and beach. 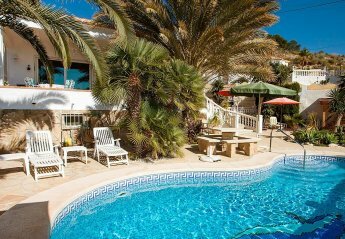 This 5 bedroom house with private pool is located in Calp and sleeps 10 people. It has WiFi, barbeque facilities and parking nearby. The house is walking distance away from golf and beach. This 3 bedroom house with private pool is located in San Dionisio and sleeps 6 people. It has WiFi, air conditioning and barbeque facilities. The house is near golf and beach. This 2 bedroom villa with private pool is located in Maryvilla and sleeps 4 people. It has a garden, barbeque facilities and parking nearby. The villa is near a beach. This 4 bedroom villa with private pool is located in Maryvilla and sleeps 8 people. It has a garden, barbeque facilities and parking nearby. The villa is near a beach. 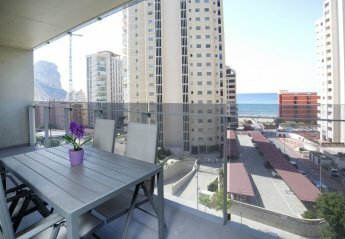 Looking for holiday lettings in Calpe? 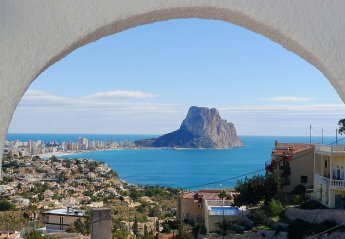 We are in the process of placing rental properties in Calpe on this page. Please enter your name and email address below and our team will email you our selection of properties in Calpe. And this is a FREE service!